The religious festival, held on the evening of the full moon day in the month of May, takes place in the 9th century A.D Borobudur temple. The monks dress in saffron robes, carry candles and orange flowers as offerings with them. Their procession starts in the evening when the temple is washed by the moonlight. They light the candles and chant holy chants. They also pray and meditate at the same time. After the completion of prayers the pilgrims follow the Pradaksina ritual, where they circle the temple three times. Marking the end of the ceremony thousands of Puja Lanterns are released into the sky that symbolizes enlightenment for the entire universe. The whole atmosphere of the festival is spiritual and tranquil. The true essence of the Buddhist religion can be understood from this grand festival. It is an amazing festival worth experiencing. You can come to this temple to see this festival. 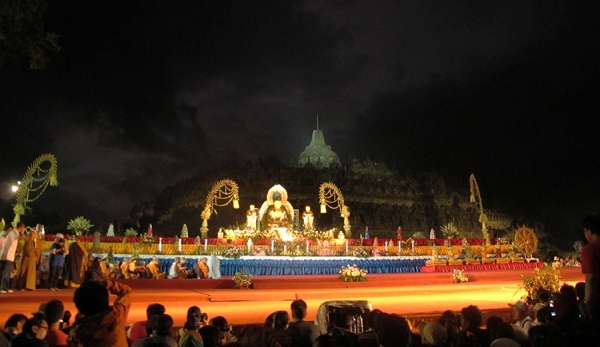 Borobudur is a popular tourist destination also. The statue of Buddha and the temple is a fine example of Indonesian art and architecture.The Vesak Festival at Borobudur Temple is an amazing religious festival that is worth taking a look and photograph.